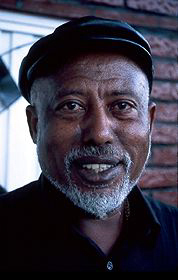 Zerihun (see a portrait of him in figure 1) was born in Addis Ababa, Ethiopia in 1941. His artistic talent was discovered at a young age. While attending boarding school he acquired the nickname “scientist” because he enjoyed working with his hands and making things. When, at the age of fifteen, he won first prize in a national art competition, he knew his destiny was to pursue the life of an artist. He completed high school, and began painting classes at the Empress Menen Handicraft School. A year later he was admitted to the School of Fine Arts in Addis Ababa where he studied from 1963 to 1968. He has been teaching two-dimensional art and graphics at the School of Fine Arts since the early 1970s. Figure 1. Portrait of Zerihun Yetmgeta. Photo by Raymond Silverman. Three artists have had a great impact on Zerihun. Two were his teachers at the School of Fine Arts, Karl Heinz Hansen, a German wood engraver who taught at the School from 1963 to 1966, and Gebre Kristos Desta, who Zerihun regards as Ethiopia’s greatest artist. He was also influenced by Skunder (Alexander Boghossian) with whom he shared a studio in the mid-1960s. 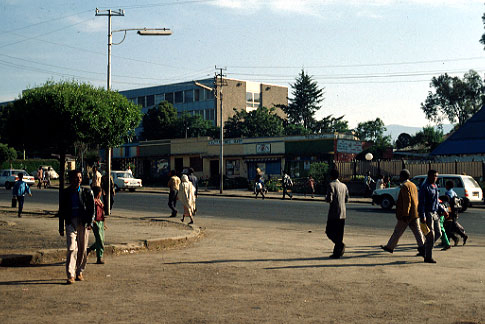 The 1974 Revolution in Ethiopia that overthrew Emperor Haile Selassie marked the beginning of a seventeen-year period of military rule and artistic repression. Much of the freedom that artists had enjoyed was supplanted by a strict policy discouraging, and at times prohibiting, artistic expression that did not conform to the doctrine of social realism. It was an oppressive environment, and many of Ethiopia’s most gifted artists fled the country to live and work abroad. Zerihun chose to stay. 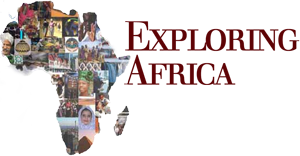 He does not regret doing so because he is passionately committed to staying firmly rooted in Ethiopia and Africa. Even so, he enjoys traveling and finds his visits to other African countries, Europe, and the United States very rewarding. The experiences he has while traveling -the people he meets and the things he sees -stimulate his mind and aesthetic senses. Many of his impressions end up integrated into his art. Zerihun’s studio (see Zerihun working in his studio in figure 2), which is located within the walls of his compound but stands apart from his house, is a round building, following the basic plan of the traditional Ethiopian church and the houses found in certain parts of Ethiopia. Its exterior is decorated with motifs derived from magic scrolls and its conical roof is surmounted by a finial, like those found on Ethiopian churches. Inside, the walls are covered with his work. Paintings are stacked in a small storage room, bearing testimony to Zerihun’s prolific creative drive. Simply looking at a corner of his studio, one can get a sense of what Zerihun is about. There is a map of the world, the cover of a Miles Davis (a renowned 20th century jazz musician and composer) record album, a self-portrait in chalk and one of his wood relief painting titled African Mask Research hangs on the wall. He has tremendous empathy for his Ethiopian heritage and his identity as an African, but also sees himself as a citizen of the world. Figure 2. 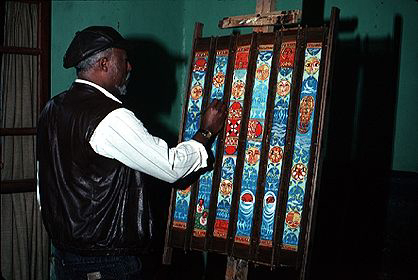 Zerihun Yetmgeta working in his studio in Addis Ababa, 1992. Photo by Raymond Silverman. 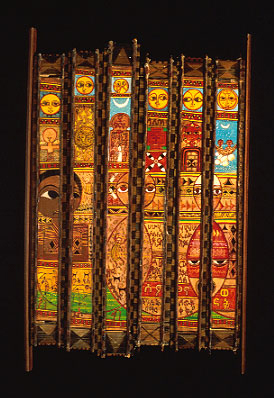 One can easily observe his passion for history and the cultural heritage of Ethiopia and Africa in many of his works (for a survey of his work go to: http://www2.h-net.msu.edu/~zerihun), like in his recent “bamboo strip” painting, Wax and Gold (see figure 3). Here he integrates images of ancient rock art from eastern Ethiopia (ca. 2,000 B.C. ), the great stone stele of the Aksumite period (second to eighth centuries A.D.), an Aksumite coin from the fourth-century reign of King Ezana, the cruciform stone church of St. George from Lalibela (thirteenth to fourteenth centuries), motifs from magic scrolls, and Ethiopic script. Figure 3: Wax and Gold, 1991. Mixed media on animal skin and wood. MSU Kresge Art Collection, 94.24. In addition, his ties with the rest of Africa are represented by renderings of a Akan akua’ba figure from Ghana and one of Zerihun’s own mask creations emerging from his study of West and Central African masks. In international circles, Zerihun is perhaps the best known Ethiopian artist. His works have appeared in international exhibitions for over 25 years. But it is in the last five years that he has received special recognition with his participation in major exhibitions in Switzerland and Cuba. In 1992, he was awarded the prestigious Prix de la Biennale at DAK’ART 92 (the 2nd Biennale Internationale des Arts de Dakar). He also has works in a number of European and American museum collections, as well as in many private collections. You will be introduced the art of one contemporary artist living in Ethiopia. This activity will touch upon Zerihun Yetmgeta’s personal ideas and how he chooses his images and their meaning. You will consider how people deal with their own past and the culture in which they grew up. The art of Zerihun will introduce students to the idea that artists often express their personal concerns in art. 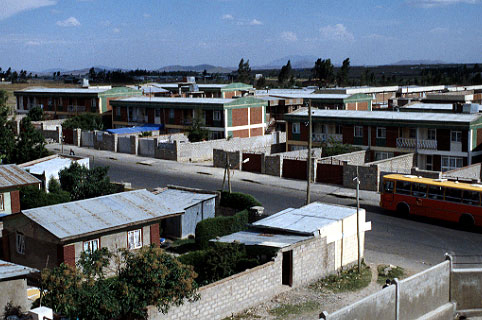 Figures 4a+b: Views of a residential area in Addis Ababa. Photo by Raymond Silverman. Look at Zerihun’s Wax and Gold (figure 3). What sort of images do you see? Knowing that he studies Ethiopian history, where do you think he finds his inspiration for this work.? The title, Wax and Gold, is the name given to a type of Ethiopian poetry; what does this reveal about is artwork? Just like in the United States, artists in Ethiopia want to tell their audience something. What is Zerihun saying with his artwork? Can you recognize any if the images in his paintings? What do they remind you of? Look at figure 5. This painting is called Fax and Email Reflection (figure 5). What sort of opinion is he sharing with this title? Do you see a connection with this title and the images in this work? Figure 5: Fax and E-mail Reflection,1997. Mixed media on bamboo strips (on animal skin). “I include very important things in my artwork -important subjects, like Ethiopian motifs, so that the Ethiopian traditional character cannot be forgotten. I am pulling many of these things out of the grave and showing them to the public. I am saying through my art: ‘This is our tradition, this is what we have to follow.’ Much of my work is deeply rooted in my own tradition. Zerihun is very interested in Ethiopian tradition. Yet, he also likes to travel a lot, listen to modern music and is interested in contemporary issues. When you look at his work, what strikes you as ‘traditional’ and ‘modern’? Why? How can tradition help people find their way in our modern world? Consider such issues as politics, environmental issues, business corruption, religion, and freedom of speech. Do you see references to these issues in his work? Knowing what you do about his life, do you think these issues are important to him? What traditions are important to you? Draw a picture in the style of Zerihun that lets people know what issues you think about. Include images that represent traditional things from your culture that you know about and enjoy doing, or learning about.